These pictures are from the long weekend where we had the most amazing summer weather. After the coldest winter I remember in recent years, I’m so happy whenever the sun is shining. The weekend was crazy though- 36-38 degrees for the whole three days which is uncharacteristic of this time of year. I’m one of the few people who loves ridiculously hot weather! 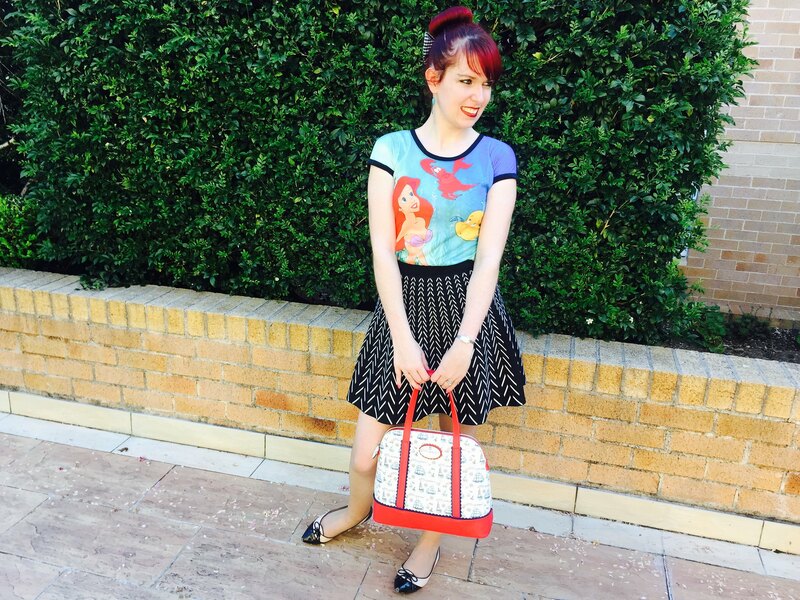 One of the advantages of this was I could finally wear my Little Mermaid top for the first time! 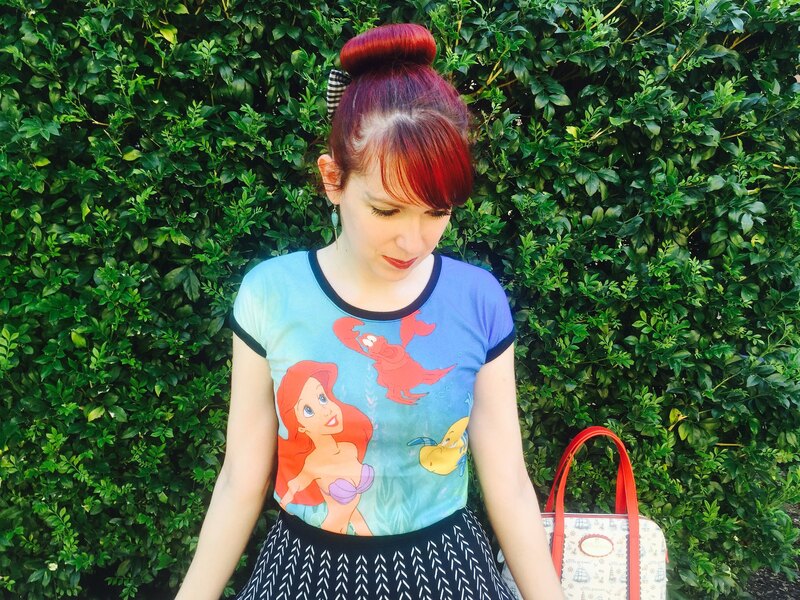 I’ve been looking for a Little Mermaid top, or any type of merchandise, for an incredibly long time but it’s always so difficult to find. I was surprised and pleased when I saw them in JayJays a number of weeks ago. They must be popular because they are sold out in most stores now. The store had a special of two for $40 so I also purchased the Bambi t-shirt. I love them so much! 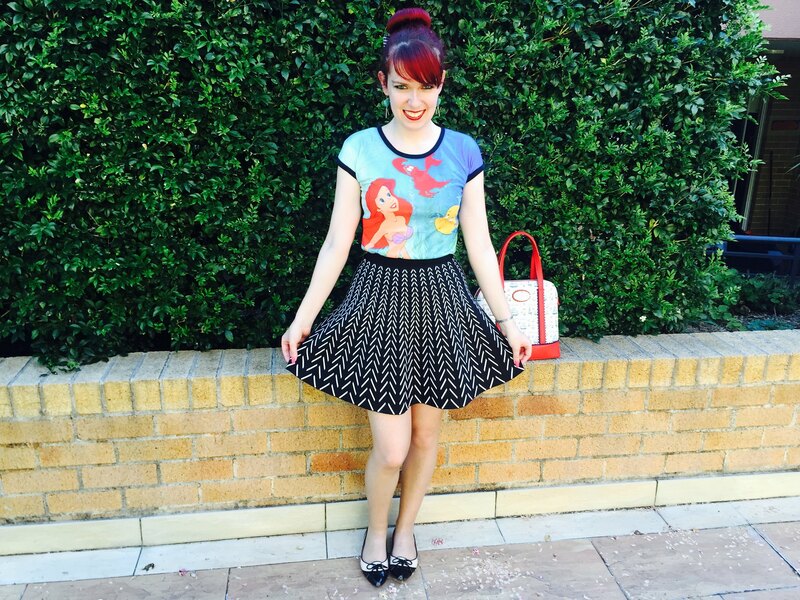 Also, Ariel is very special to me- she’s always been my favourite and reminds me of my childhood. I just wish I could get my hair is red as red as Ariel’s hair. It was a little challenging deciding what to wear with my new top. I didn’t want it to clash with, or detract from, the feature of the top. At the same time I didn’t want anything too boring such as plain black. 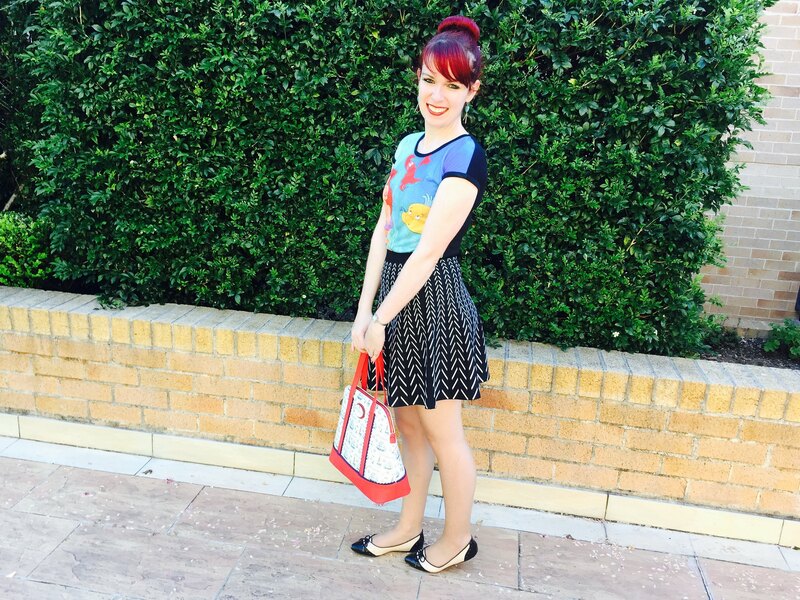 I thought the patterned black skater skirt worked well. I love my B.A.I.T Footwear flats which are my most worn shoes; I’m planning to create a separate post on this soon. Of course, I couldn’t resist using my new bag for the first time. The print is so adorable and the nautical print also fits in with the sea theme of the top. I LOVE how red my hair looks in these photos. 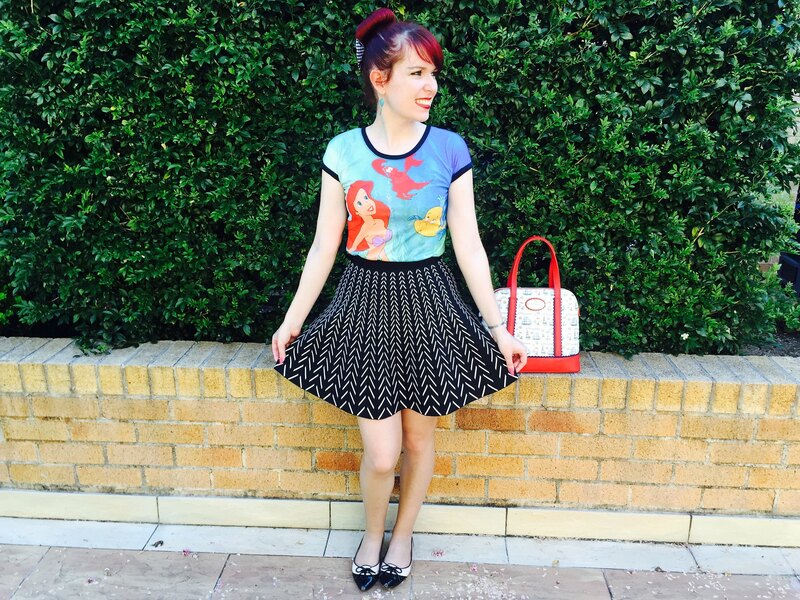 This entry was posted in BAIT Footwear, Disney, Forever New, JayJays, Kitten D'Amour, Outfits. Bookmark the permalink. Glad you got some nice weather! That is such a cute skirt. What a fun skirt! I love the flats too! Such a lovely outfit, that tshirt is amazing! This is so cute!!! Love the playfulness of the top. Love print on print:). Cute:). Gorgeous as always!!! 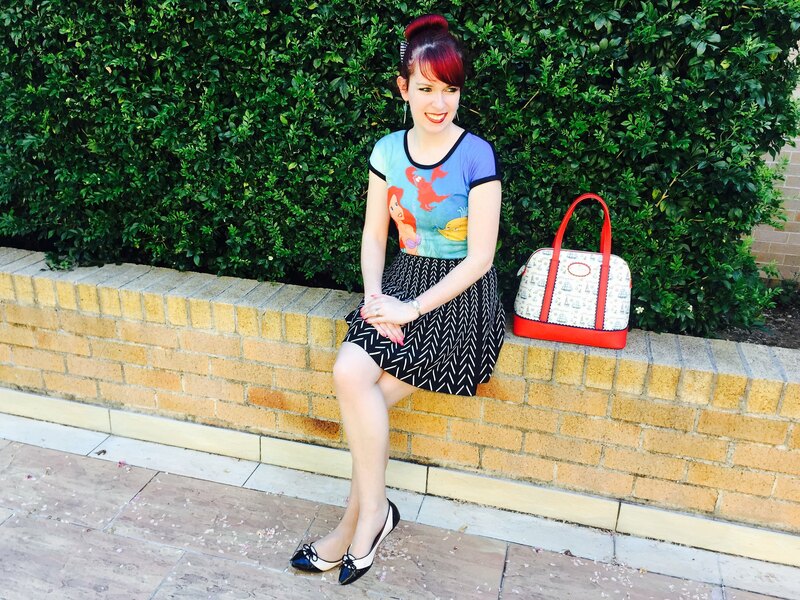 Love your style and blog girl! Keep it coming! I see you have your new bag! 😀 So fun to wear it out with this top. I love your theme!